Damian Lewis in the "Life" series finale. Letters, I get letters, and today's mailbag deals with canceled series, strange cliffhangers and more. Dear Alan: I've enjoyed "Life" and want to at least bring an end to it. How about one more to tie up the loose ends? 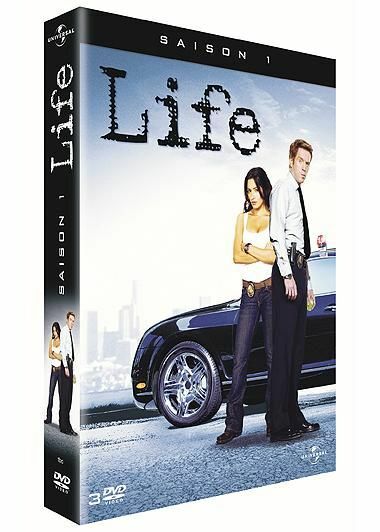 Alan says: Seemed to me that the "Life" season two finale did as good a job as possible of tying up loose ends. It featured the final confrontation between Charlie Crews and archnemesis Roman Nevikov, explained as much of the conspiracy theory as I imagine even "Life" creator Rand Ravich understands, and even bumped off the documentary filmmaker who first appeared in the pilot episode. I'll miss "Life" -- particularly Damian Lewis' commanding performance as Crews -- but that's not a show where it can be said viewers were left hanging on any major plot points by the cancellation. Dear Alan: I thought you would have received a deluge of e-mails regarding the horrible, disappointing "Private Practice" finale. I realize the need for a "cliffhanger," but this was ridiculous! To leave the ending with the doctor's life in the balance -- at the hands of a deranged patient ready to perform a C section she knows nothing about -- was over the top. The writers went overboard! I don't want to watch this show again, which was getting crazy anyway this past season! Alan says: That ending (with Amy Brenneman as the doc in danger) was among the more demented cliffhangers I've ever seen on a TV show. Creator Shonda Rhimes isn't talking, but presumably someone's going to walk in that door in time to save Brenneman, which means a whole lot of people were creeped out over nothing. I don't object to a good cliffhanger -- or, for that matter, a good horror movie moment -- but that ending felt so tonally out of whack with what "Private Practice" usually does that it felt unfair to the show's audience. Dear Alan: Can you answer this "Grey's Anatomy" question since I obviously missed the reference somewhere in this season or all the seasons? How did George writing 007 in Meredith's hand clue her into who John Doe was? It is driving me crazy. Alan says: In the first season of "Grey's," the other interns maliciously nicknamed George "007" -- as in "licensed to kill" -- because he had screwed up a surgery and Dr. Burke had to step in to save the patient's life. Dear Mr. Sepinwall: Please tell me HBO is going to continue "The No. 1 Ladies' Detective Agency," my new No. 1 favorite show! Sunday night, I sat down in front of the TV and -- boom! -- it wasn't on. What happened?? It is such a great show. Alan says: No decision has been made about the future "No. 1 Ladies'" (which finished airing its seven-episode season a few weeks ago), but it's going to be a complicated renewal. It's a co-production between HBO and the BBC, filmed internationally in Botswana, with a star (Jill Scott) who also has a thriving music career, plus two creative forces (producer Sydney Pollack and director Anthony Minghella) who died after the pilot was filmed. I'm not saying it won't be back, but nobody knows anything right now. And the way HBO operates, it doesn't always have to announce pickups right away. See the example of "Curb Your Enthusiasm," which has been off the air since November '07; Larry David comes back if/when he feels like coming back, and the next season will debut later this year, at a date TBD. Dear Alan: Curious as to why "Eleventh Hour" was canceled, given that it attracted a respectable viewing audience and was a quality show. Seems to be similar to what occurred with "Shark," another entertaining show. Also, why would Fox move "Fringe" opposite "Grey's Anatomy" and "CSI"? Alan says: The ratings for "Eleventh Hour" were actually not very good, especially considering the huge lead-in audience it got from "CSI" at 9. ("Shark" also struggled to retain enough of the "CSI" audience, and died when it was moved to Sundays in year two.) I can't speak to the ultimate quality of the show, as I stopped watching after the toad-licking episode, but what little I did see didn't really distinguish it from CBS' other science-based crime procedurals. As for "Fringe," Fox is gambling that "CSI" (which has dipped in the ratings since William Petersen left) and "Grey's Anatomy" are now old and vulnerable enough that "Fringe" can do okay -- especially given how well "Bones" performed when it moved to Thursdays at 8. Dear Mr. Sepinwall: Our thanks for all you have done to help save "Chuck." While it will be a long wait until the new shows arrive, this is truly a case of "better late than never." We appreciate your efforts on behalf of "Chuck" fans everywhere. Alan says: A whole lot of people -- fans, bloggers, other critics -- played just as big a role in bringing "Chuck" back. I'm just glad we'll get more episodes of it.